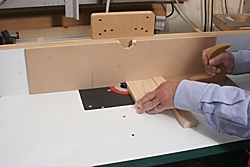 I do not use a mitre fence on my router table for the reasons given in the ‘Mitre Fence’ entry in Router Table Tips. Instead I use a right-angled push block, which does not require that the table fence is set exactly parallel to the mitre fence slot. It is often recommend that you hold a piece of scrap material between the workpiece and the push block to prevent breakout, but you can improve on this by incorporating a sacrificial breakout piece in the block itself. My latest push block is made of a piece of 18mm MDF cut to an exact rectangle of 225 x 135 mm. Across the front I cut a slot with a 1/4in slotter, and then screwed a handle, copied from my smoothing plane, to the top of the MDF. I then took a length of batten and with the same slotter cut a tongue along the length of one side. The tongue pushes into the slot in the push block, lined up with the side that runs against the fence. 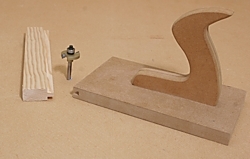 This avoids the problem of holding two pieces of wood – workpiece and breakout piece – when you make your cuts. Make the tongue a millimetre or so narrower than the depth of the groove. When the end of the breakout batten is cut up, remove the batten, cut the used end off and replace, ready for the next cutter.